The first mention of the Church of the Holy Spirit, built to serve the faithful outside the walls of the city of Warsaw, is found in the fourteenth century. 1388 – Foundation of the first Warsaw hospital by the church. 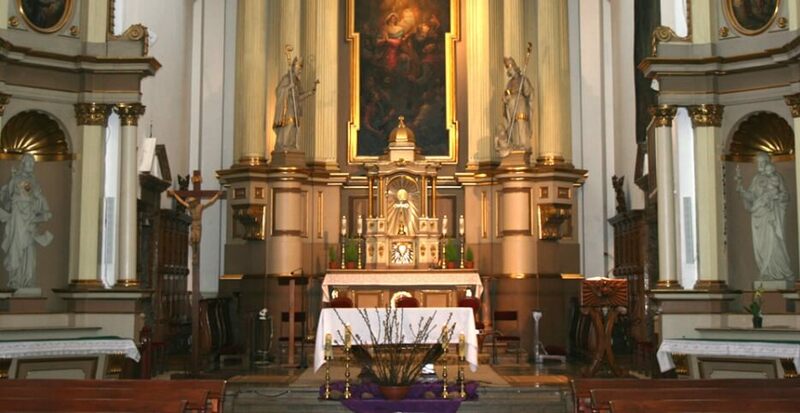 1504 – At the request of the mayor and councilors of Warsaw, Jan Lubrański, bishop of Poznań, allowed the chapel of Our Lady to be built at the church. 1579 – Literary Brotherhood of the church of St. George moved to the Church of the Holy Spirit, where they run the school. 1655 – During the Swedish invasion the church was completely ruined. 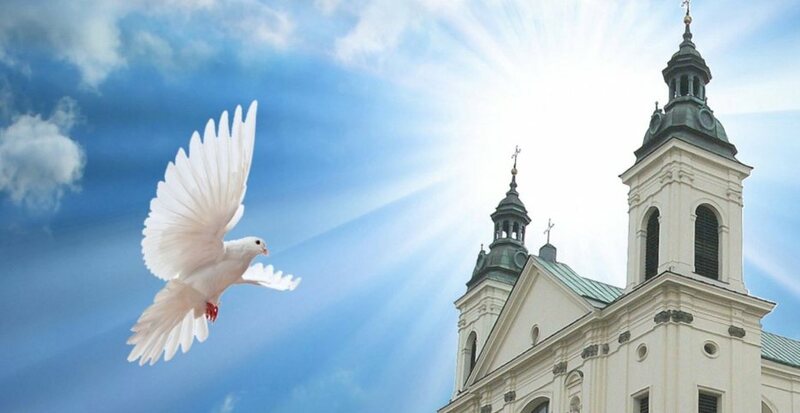 At the request of King John Casimir, in recognition of the heroic defense of Jasna Gora, the municipality of the city of Warsaw gives the Church of the Holy Spirit to the Pauline fathers. 1662 – Wojciech Tolibowski, bishop of Poznań, gives the church and utility buildings located next to it to the Pauline fathers. 1666 – Renovation of the chapel of Our Lady of Jasna Gora by the Fukier Family. 1696 – February 14, Mikołaj Popławski – By the Church, Bishop of Livonia founded the Brotherhood of the Five Wounds of Jesus. 1707 – The Pauline fathers began construction of the today’s church by the project of Joseph Pioli under the supervision of Bellotti. 1708 – The great plague struck Warsaw and the country. That year, the Pauline fathers organized the first pilgrimage from Warsaw to Jasna Gora to beg Mother God to avert the plague. 1711 – After the cessation of the plague, the pilgrimage departed from the Church of the Holy Spirit to Jasna Gora, with a vote of thanks from the city of Warsaw to the Blessed Mother. From that year dates back the continuity of Warsaw Foot Pilgrimage conducted to date by the Pauline fathers. 1819 – The tsarist government removed the Pauline Fathers from Warsaw, the church was taken over by the Brotherhood of St. Benno. 1845 – A two-sided entrance was built before the church and roof and towers were converted. 1863 – After the January Uprising in front of the church a statue of Our Lady was placed, a work by Chajkowski. 1944 – During the Warsaw Uprising the interior of the church and the roofs was completely burned out. 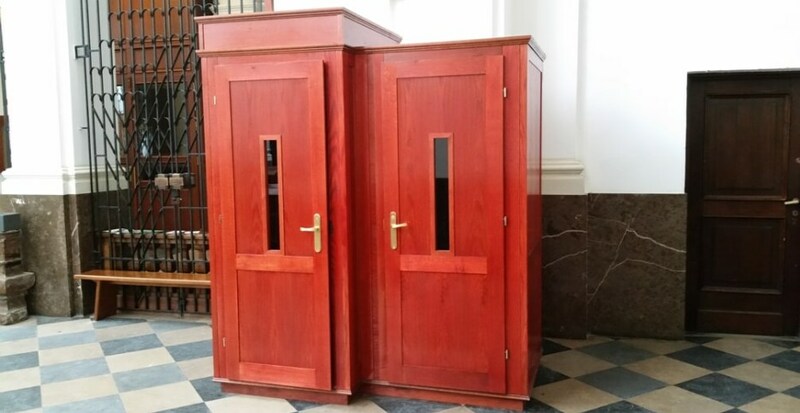 The only objects that survived were the altar under the choir, the metal cross on the pillar, the base of the vaults, the front door, the marble door to the chapel of Our Lady and the sacristy. 1947 – August Cardinal Hlond, Primate of Poland, gave the Church of the Holy Spirit to the Pauline Order. 1950 – April 16, after 130 years, the Pauline fathers took over the Church of the Holy Spirit and part of the former monastery, starting their reconstruction.